Tanimura and Antle, a grower and shipper of produce, has begun adding QR codes to several of its products in order to reach out to consumers. 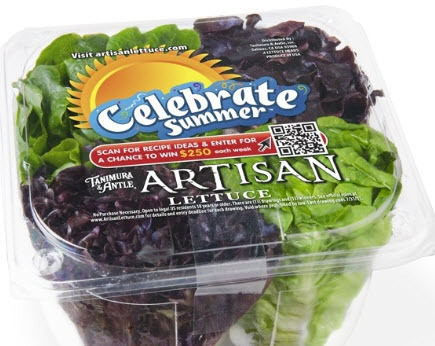 The company has introduced the codes on packages of its Artisan lettuce and Artisan romaine produce, allowing those with smart phones to access content associated with these items. QR codes have long since become an adequate medium for businesses to reach out to consumers and provide them with product information, special offers, or other kinds of content they might find interesting. The codes affixed to packages can be scanned using a smart phone or similar mobile device equipped with a QR code scanning application, most of which are free. These codes link to videos that detail the growing process of the product with which they are associated. Tanimura and Antle is keen to ensure that consumers know exactly where their produce is coming from and what goes into the growing of these foods. The videos also provide foodservice-specific preparation tips regarding the produce they cover. Diana McClean, director of marketing for Tanimura and Antle, claims that QR codes are an effective way of reaching out to customers in real time. Because much of the produce grown by the company serves in the foodservice industry, Tanimura and Antle expects that the information regarding how its various products are grown will be well received, especially given the fact that the foodservice industry prides itself on freshness and quality. QR codes have become a staple in marketing and information distribution. The barcodes have proven to be popular with consumers, thereby becoming popular with businesses as well. Tanimura and Antle’s use of QR codes may not be innovative, but it does provide its customers with access to information that they have been demanding.